Looking to have more fun than one should have on a Friday night? Head out to Spark Arts in the Castro, on Friday April 19th, starting at 7 p.m. for an evening of conversation, cocktails, photo exhibit and book launch party, with local author Heather Jacks and the Sisters of Perpetual Indulgence. 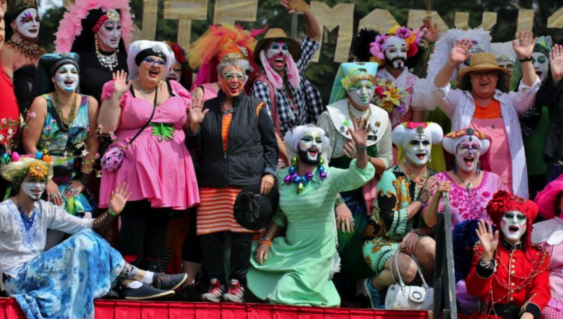 Jacks’ new book, three years in the making, Sister Stories…in their own words; is a stunning 200 page hard cover coffee table book, featuring San Francisco’s own Sisters of Perpetual Indulgence, who turn 40 this April. This spectacular journey into the irreverent, compassionate world of these queer activists offers a rare glimpse at the remarkable people behind the habits. Who are these nuns? What is The Sisterhood? How did they find themselves within it? Award-winning author Heather Jacks and respected photographer Benjamin Benoit set out to answer those questions. Over the next three years, they produced a unique selection of essays, interviews, and stunning photographs documenting the Sisters and their personal stories; featuring interviews with Nuns – including remaining founding members of the group. Sister Stories…in their own words… is a compelling look at a cultural movement, an important piece of queer history, and gorgeous piece of art. The April date also marks the launch of #WhistleStopTour2019, a six month nationwide train trek across the USA, in which Jacks will be hosting, interactive conversations and pop-up art shows, with Sisters of Perpetual Indulgence at Sister Houses. “These are not your typical book signings, but in-depth, deep dives into LGBTQ+ History, Issues and Rights; where they have been and where they go in the future.” Jacks commented. “I will be visiting tons of cities, including Sacramento, Nashville, Memphis, Alabama, New Orleans and many others.” During the tour, Jacks will be interviewing Sisters from across the country for the second book in the series, Sister Stories….from the Road. IF you would like to host a stop on the #WhistleStopTour, drop a line at: heather@heatherjacks.com.